What are Small-Group Training Sessions @ UFIT One-North? Our small group training sessions at One-North are designed for an excellent full-body workout in an indoor setting. These classes are designed to help your fitness goals - whether it’s to build strength, improve your endurance, or to lose body weight. Our classes place an emphasis on strength work using our gym equipment (dumbbells, barbells, ski-erg, rower, assault bikes, battle ropes, kettlebells and more) with some cardio and core work thrown in to get your heart rate up! Join us if you need a quick lunchtime exercise session in a fun group setting! We have sessions that suit everyone led by our highly-qualified UFIT Coaches. As class sizes are kept to a maximum of 10 people, you’ll benefit from the close attention of a fully-qualified personal trainer, whilst enjoying the dynamic and motivating energy of a group. They are also kept at an affordable rate for you to supplement your fitness routine. Our trainers will tailor the session to suit each individual’s abilities and goals, with the aim to maximise your results quickly and safely. All fitness levels are welcomed. Claim your free trial from April 22-April 27. Our classes run everyday from Monday to Friday at lunch time from 12-1pm and Saturday morning from 9-10am. Each session has a different emphasis to make sure you are hitting all your training goals, whether it be increasing strength and learning correct lifting techniques or getting your blood pumping and improving your cardiovascular fitness. Pricing - Our Small Group Training sessions start from $42.80. 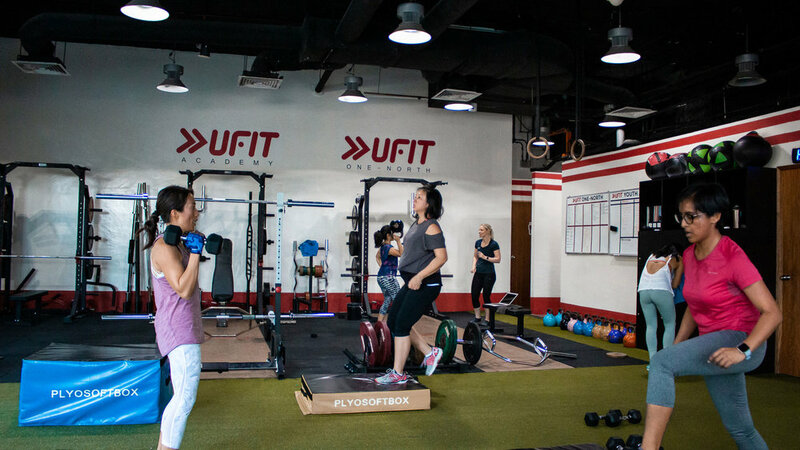 Contact our UFIT One-North outlet for group personal training rates. Flexibility to pick any classes. Group Personal training option will require you to attend the group personal training session with your training partner whereas you can drop in any small group training session during the class timings. Are there any shower facilities? Yes, our gym at UFIT One-North is equipped with shower facilities. Towels are also provided as well.